History has proven over and over again that no multi-racial or polyglot society has survived for long. We have seen that a healthy body will not and cannot tolerate any alien organisms in itself, so also a society cannot survive admixture with alien elements. Let us learn this basic lesson for all time and heed it and heed it well ! Let us state it another way : Any society whose elements are composed of two or more differentiated races will perpetually be at war within itself until it destroys itself. Usually the dregs of such a society will destroy the best elements and the former will survive to occupy the real estate in a more primitive social structure. Anarchy, poverty and misery will then become its normal life style. A prime example of this is the history of Haiti. But history abounds with any number of other examples. In our book, Nature`s Eternal Religion, we have cited a few such as Egypt, India and others. America, the hope of the world, is now undergoing the final stages of self-destruction because it has not heeded the eternal lesson of history and the Eternal Laws of Nature : no multiracial or polyglot society survives for long. Let us state another basic truth : the inferior always envies and hates the superior. The poor hate the rich; the weak hate the strong; the sick hate the healthy; the dumb hate the intelligent; the ugly hate the beautiful, and the dark races hate the White. That’s the way it is, and probably always will be. I neither invented this situation, nor am I happy about it, nor did I decree it. I am simply observing a fact of life. Creators not only hope for a society that is relatively sound, stable and prosperous, but one in which the vast majority of individuals themselves are superior and one in which the quality of life is high. We want each individual, or at least the overwhelming majority of individuals to have all the best things in life: intelligence, health, beauty, wealth and happiness. Not only do we hope for such a society, but we are actively working to bring it about. In a deteriorating world that is rapidly crashing about our ears, we are not pessimists, we are optimists. We strongly believe our type of world not only can be achieved, but we are damn well determined to bring it about, come hell or high water. For us it is either do or die. I have stated in the beginning that only a homogenous society can be stable and survive. Homogenous means one kind, the same race, and more or less the same level of intelligence, similar moral standards, similar basic goals, ideals, religion and culture. So what kind of homogenous people do we have in mind as inhabiting the world of the future ? Do we want a world populated with negroes ? Of Chinese ? Jews ? Or do we have the same goal in mind as the multiracial United Nations who has a statue enshrined as the (neuter) man of the future, faceless, sexless, mongrelized, raceless, brown in color and hands clasped behind its back for easy hundcuffing ? No, indeed, we want none of these. Our religion is not designed for negroes or mongrels, nor any of the dark races. We go back to one of our basic premises, namely, in everything we look at life and the world from one viewpoint and one viewpoint only. We do not look at it through the eyes of the snake, nor the negroes, nor the Jews. We look at everything through the eyes of the White Race. The people of the future world must be the White Race and the White Race exclusively. The world is becoming too crowded and too small to support a multitude of races either side by side, or intermixed. The White Race cannot survive in either of such worlds. It can only be either absorbed and mongrelized or be out-bred and exterminated. We do not accept either alternative, and have not the slightest desire to be part of a debauched and depraved society of clawing, starving mongrels. No, for us it is either all, or nothing. Having made that decision, we must move heaven and earth to implement it. In so doing let us keep in mind that the future White Race we foresee is not merely such as it is today, but the vibrant, dynamic super race that we have the potential of becoming. Now with the advent of Creativity, we have the knowledge and the programme to enable us to realize our great potential. It now remains for us to build and expand our organizational structure to bring about the greatest of all dreams ever envisioned by mankind. In endeavoring to bring about such a bright and promising future for the White Race we must, as I have said a thousand times before, first of all straighten out our thinking. 1) We must throw overboard the Christian-Democratic idea that all men are equal. This idea has been foisted on us by our most dangerous enemies, the Jews. They don’t believe it themselves and consider all non-Jews as goy, or stupid cattle, to be exploited, manipulated and destroyed. Nature says loud and clear men are unequal, races are not equal, all species are unequal. Let us never forget this. 2) We must realize that no multi-racial society, or polyglot society, nor even a pluralistic society can survive for long and in the short or long run it becomes impossible to govern such a society. Not even a country that is a patchwork of different nationalities, religions and languages, even if it is essentially White, will last for long. The Austria-Hungarian Empire is such an example, where Germans, Hungarians, Croats, Serbs, Rumanians and Czecks all were lumped together with their different languages, religions and cultures. We must realize there exists no fair and equitable set of laws, no government that can be acceptable for all. What is for the benefit of one is to the detriment of another group, and only strife, dissention and anarchy can ensue. 3) Since the earth is rapidly becoming overcrowded beyond its capacities to feed and sustain such huge numbers, hundreds of millions, yes billions, are going to starve, and that situation is already well under way. It is up to us to see to it that in such a catastrophe the superior are not the main victims, and that the inferior (temporarily) survive. We must make damn sure that it is the White Race that survives, and we must organize and polarize now in order to have the power, organization, loyalty, leadership and wherewithall to do so. 4) We must accept the fact that not all people are worth saving. Even among the present White Race there are parasites, drones, insane, morons, pathological criminals and genetic cripples that the world and our White society would be better off without. Nature gives us a further law in this respect – Any organism that fails to excrete its wastes, soon dies. 5) We must realize that no government exists, or ever will, that can satisfactorily govern a heterogenous society, or even keep such a society of diverse elements from collapsing. The reason for this is fairly obvious. When any country or society is fragmented by two or more diverse elements there exists no common goal or interest, only rival pressure groups at war with each other and continually seeking to gain the upper hand. Such war may be covert or submerged for some time, but sooner or later it flares out into the open and escalates into open civil war and anarchy. The more differentiated these elements are, the more fierce and bitter is such warfare. The end result finally is either the suicide of all groups, or the emergence of the group, or race, or element, that was best prepared to fight and survive. This is not necessarily the most constructive and intelligent of such a society. In fact usually the lowest elements, as in Haiti, survive. Let us remember that Darwin’s Law of “Survival of the Fittest” is not quite correctly stated. The shark and cockroach have survived for hundreds of millions of years, but are not exactly the most beautiful or intelligent creatures on the face of the earth. From our viewpoint we would hardly regard them as being either “the fittest” or most desirable. It is only those who are fittest in the game of survival that do so, but by no means the best or most desirable from the White Man’s point of view. After the American Revolution when the first census of the United States was taken in 1790 the total White population was 3,172,444. The estimated population of all the territory that now comprises the 48 continental states was approximately 4,000,000. Of this number approximately 3,250,000 were White, the balance being Indians, negroes and mixed breeds. Of the White population 90% were of Nordic stock, mostly English and Scotch, and 99% of the total White population was Protestant. As far as the negroes were concerned they were then of no political significance, since the Constitution regarded them as no more than chattel, or property. The Indians were a different matter. Many of the tribes encountered were undoubtedly the most formidable fighting men of any native race that the White Man has ever come up against in his expansion and conquest of the world. Madison Grant, who wrote “Conquest of a Continent” deemed them as beyond question the cruelest of all mankind, even more so than the Ancient Assyrians. The tortures which they inflicted on their captives, whether White or red, are revolting in the utmost, and were usually carried out by the squaws while the bucks sat around and laughed at the agony of their victims. Grant concludes – “No one who knew the true nature of the Indian felt any regret that they were driven off their hunting grounds”, and the Whites regarded them as nothing more than ravening wolves or worse. In any event, the Indians slowed down the westward expansion of the founders of the Thirteen Colonies, but were of no political or racial consequence. So in the period ending in 1790 we find an America with a White population greater than half of that of Great Britain, and Nordic to the core. It was racially, culturally and religiously the most homogenous group of people of any country in the world. Before it lay a vast, rich continent to the west, empty except for the sparsely scattered aborigines. The American White Race was poised to conquer and build the greatest and wealthiest country in all history. Never in all history was a more shining opportunity laid at the feet of any people. In less than a century that conquest was complete from the Atlantic Ocean to the Pacific. Today America has degenerated to a polyglot melting pot (read slop pail) that is heading into an abominal disaster. It has now become a vast conglomerate of conflicting pressure groups that have no common goal, objective, interest, or anything else. We are now divided into hundreds of divisive power groups all at war with each other. We are divided racially into every base element found on the face of the earth. Even the savage Indians today have a lot more political clout than they had 200 years ago when the White Man’s numbers were relatively and infinitely smaller and the Indians larger. We are divided by hundreds of religions, Mormon, Catholicism directed from Rome, and above all, Judaism, whose tribe now rules and ravages the country. We are divided by political parties, by labour unions, religious groups, class warfare, by homosexuals, feminists, you name it. Each one has a power group fighting for its own separate interest. Today America are undoubtedly the most heterogenous, the least homogenous, the most fragmented nation on the face of the earth. Such a nation cannot be goverened for long, nor can it exist for long. When the French gifted us with the Statue of Liberty which said “Give me . . . the wretched refuse of your teeming shore”, we swallowed a philosophy that was as deadly as any of the refuse itself. Remember, any organism that cannot excrete its refuse soon dies. Any organism that is willing to ingest the refuse of others is absolutely insane and doomed to die. The Americans of 1790 had before them the most wonderful opportunity that had been the good fortune of any homogenous group of people ever to be blessed with. They blew it. They goofed. They unwittingly threw away the most auspicious circumstance in history. Why did such an intelligent people so miserably fail to make the most of such a glorious opportunity ? The further answer, in large part of course, is that the Jew invaded their shores, and polluted and perverted their thinking. Such invasion was small at first but by the 1880’s began to become a veritable flood. Today half the Jews of the world sit on the backs of the American people and are in virtual control of all the finances, the news media, the education and the government of this Jew-ridden country. In short they have us hog-tied and are setting us up for the final slaughter. Late as it is, it is the goal and the programme of Creativity to save this nation from collapse and destruction. Actually, it was not the fault of the early builders of this great White nation. They did their part and they did it beautifully. It was those who came after them that let down the White Race and betrayed it. We must fully realize that as goes America, so goes the White Race. It is our avowed aim to first of all break the power of the Jews and wrest that power back into the hands of the White Man who founded and built that country. We then must expel these parasites from our shores. It is our programme to ship the negroes back to Africa, and the Mexicans and other dark races back to wherever they came from. 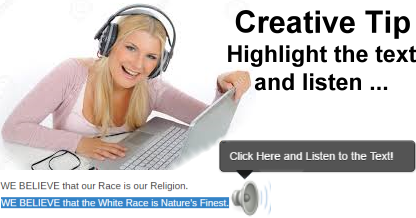 It is our objective to make that country a rich prosperous and beautiful land for the White Race and the White Race alone, to convert and educate the White Man back to the fundamental truths of race, to accept a racial religion and build a finer better race and finally a Brighter and Whiter World. We can blame the Jew for the mess we are in, after starting with such a golden opportunity in 1790. But this would not be exactly the whole story. We ourselves are to blame. If the White Man of 1790 had discarded his unreal “spooks-in-the-sky” religion foisted on him by the Jews and adopted a sound racial religion such as Creativity, we would not be in the abysmal mess we are in today. The Founders missed a golden opportunity just as did the Romans two thousand years earlier because they too did not have a racial religion. If the White Man had been armed with a racial religion the Jew would never have had a chance, either with the Romans or the Americans of 1790. It is our sacred religious and racial duty to undo the damage that has been done, and bring the White Man back to his senses. Not that we want to restore the America of 1790, or the Rome of the Caesars. That is impossible. But now, with our present-day knowledge, with the programme of Creativity and with 500 million White people as the basis of our gene pool, we can build a world that would bedazzle both the early Americans and the ancient Romans alike. This we can do, and this we must do.